by Lorna Hannan, March 2009. The monument at the Victoria Street end of Errol Street was erected by the local Red Cross to honour men from North and West Melbourne who fought during World War I (1914-1918) in France and Palestine and at Gallipoli. A metal plaque that was added later names wars up until the 1970s but, unlike most of the monuments in the main streets of Victorian country towns, this one does not give the names of the men it asks us to remember. 104,787 men enlisted from Victoria to fight in the 1914-1918 war. The majority of them — 95 per cent — had been born in Victoria. Of those, 667 were born in North Melbourne, which they and their parents may still have known as Hotham, and 229 gave West Melbourne as their birthplace. Of course, when they enrolled many of them were not living in the area. We can identify many of those who did live locally because after World War I the three state primary schools had honour boards made listing the names of former pupils, both those who had enlisted and those who were killed. Most of them had been living in the district when they enlisted. Thanks to the vigilance of local history librarian Heather McKay, the boards made for the King Street (some 250 names) and Boundary Road (with about 100 names) state schools are now in good care at the North Melbourne Library. The Errol Street honour roll is gone — no one knows where but in the 1930s the listed names were published, so we do have a record of them. Taken together, these three honour boards make up a sizeable proportion of the 'local lads' who enlisted. 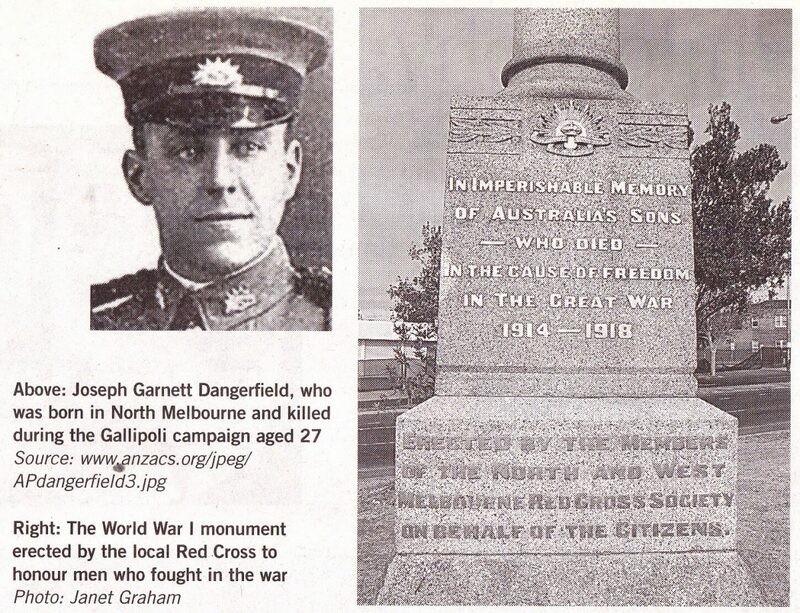 One such was Joseph Garnett Danger-field, who was born in North Melbourne, lived at 29 Canning Street and was a pupil at Errol Street. There he completed the Merit Certificate, which in those days came at the end of grade 8. Merit was as far as school went for all but the very small minority who went on to university. When Joseph finished school, he went first to the Central Business College in the city and then on to work for the Australian News Company. When he joined the army, he was trained down at Queenscliff as a gunner. He was 27 when he died, killed in action during the Gallipoli campaign. He had the rank of lieutenant. People in the Hotham Hill area will recognise his Canning Street home. It is the house next door to 'Bangalore' — one down from the Dryburgh Street corner. Perhaps he was known as Joe? His belongings were returned to his mother, Janet. In the papers relating to his war record, they are listed as an "Inventory of Effects". The list is as follows: a service tunic, a pair of service breeches, two flannel shirts, several handkerchiefs, a towel, singlet, fly net, leather pouch, military book and a photo. There was also a tin box with pyjamas, three khaki collars, several books, a pair of field glasses, shirts, a cap and some letters. One of the books was In Green Pastures, a religious work written by J.R. Miller (1840-1912), which was said to be popular with Sunday school teachers. Joseph's mother, Janet, had herself been born in Melbourne. Her first husband, an Englishman, died after they had been married for about eight years. Their first child had died in infancy but there were two little girls and a boy when Janet remarried. Her second husband, a Dubliner, was Joseph's father and father of another four of her children. One drowned as a nine-year-old when the family was holidaying in Geelong. Janet herself lived until 1933. Perhaps she knew John Davis's sister. She was a Miss J.E. Davis who was living at 463 Dryburgh Street and whom John had nominated as his next of kin. John was a veterinarian who survived the war. In the following few months, the army gave him a cost-of-living allowance and paid his fees while he attended Pitman's School in London. A family that was still well-known in the area but whose names do not appear on the honour boards are the Fogartys. From a family of 10, three brothers enlisted. When they were young they went not to the state schools but to St Mary Star of the Sea and then off to board at St Patrick's College in Ballarat, where they completed their secondary schooling. Their father, Thomas Fogarty, had been a mayor of Hotham four times during the period 1873-1896 and continuously a councillor between 1873 and 1900, but by the beginning of World War I the family was not living in West Melbourne Andrew Christopher (known as Chris) had become a grazier, Joseph was a doctor and their brother Thomas was a city solicitor who lived in South Melbourne. Only a few years before the war started, the Fogartys were making their names as footballers. Tom, a ruckman, had played with St Kilda, South Melbourne and University. Doctor Joe had played for South Melbourne and later with Essendon, and Chris, also a ruckman, made quite a name for himself in the Essendon team. Chris died at Gallipoli. His brother Joe, who was there and identified Chris's body, was awarded the Military Cross for bravery in the battle at Pozieres and took up life as a doctor when he returned home. Tom, who was much troubled by the war experience, came back to Victoria and worked in the law for several years before taking his own life. Fogarty Street, on the border of the North Melbourne Recreation Reserve also known as the Arden Street Oval — is named after the father of the family. Christopher's name is inscribed on the Anzac Cup that is played for annually during the football season, and the big stained-glass window that faces out of St Mary Star of the Sea onto Victoria Street is dedicated to him. Lorna Hannan Hotham History Project.